How did we get an entire week into October already? Are you a Halloween fan? 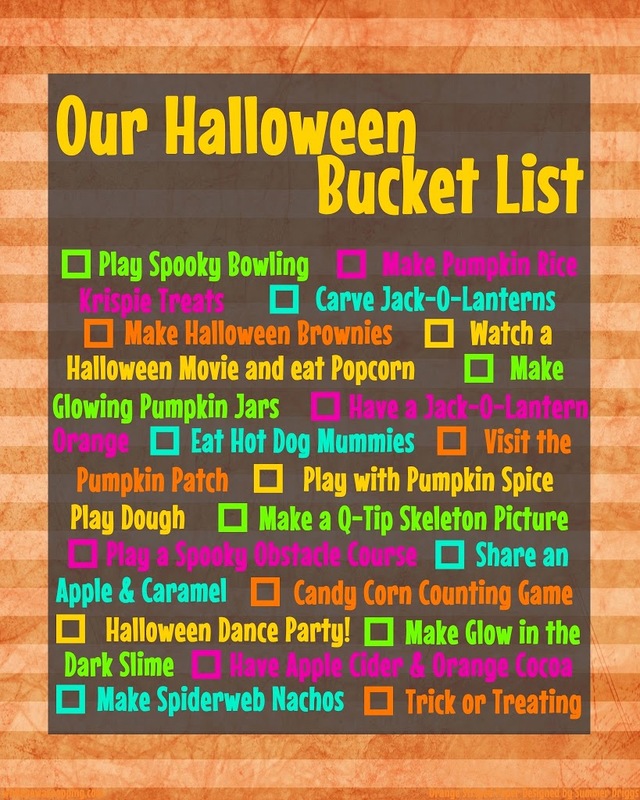 Do you have a Halloween Bucket List that you want to complete this month? I love Halloween. Not the creepy, gross, scary parts though because gore just isn’t fun for me. I like cute Halloween. And you better believe my kids and I celebrate all month long! There are some things we’d like to do before October passes us by, so I made a Halloween Bucket List for us. There are games, treats and snacks, and fun things to do! Halloween is such a fun holiday. My mom didn’t love Halloween and we didn’t celebrate much growing up. I think I’m making up for it now. And I don’t see anything wrong with that! You are more than welcome to print off your own copy so you can celebrate too! Right click and save to your computer. I’ve also attached links under the print to some of the activities, so you can find out how to do them too (and in case I forget, ha). Happy Halloweening and, most of all, enjoy and stay safe! Any other questions… let me know!